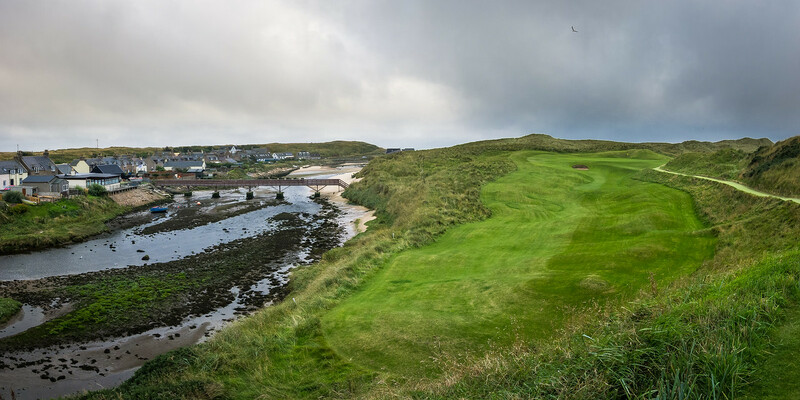 As I sat down to write about Cruden Bay, it dawned on me that a review in the traditional sense is pointless. 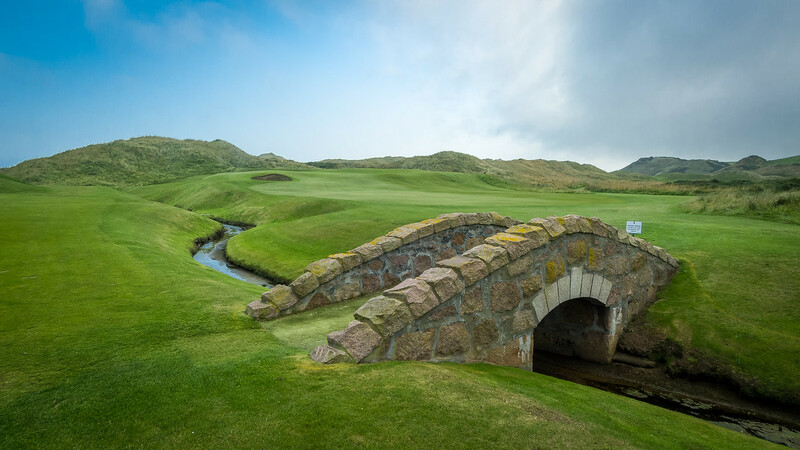 Everyone who knows of Cruden Bay either already loves it or has it on their bucket list. No one needs me to tell them that Cruden Bay is worth their time. The course is fantastic. Everything you’ve probably heard about it is true. Play it if you have the chance. It’s one of the best settings for a clubhouse I’ve ever seen. You walk in through the front doors to a dining room with panoramic windows that seem to overlook the entire golf course (they don’t, it just appears that way). I’ve never seen anything like it. Possibly the only thing better than playing a round of golf at Cruden Bay is sitting in the clubhouse with a pint afterward watching other golfers finish up their rounds. After my round, my family and I had dinner in the clubhouse, and it was one of the better dining experiences we had while in Scotland. Not only was the food superb but like everywhere else on the property people were warm and inviting. There was an interesting mix of clientele dining in the clubhouse; from members to visitors, to locals celebrating a birthday. The clubhouse feels more like the centerpiece of the town where everyone congregates rather than a golf club. We stayed right down the road at the Cruden Bay Bed and Breakfast, operated by a lovely man named Ian. The breakfast and lodging are nice enough but where it truly stands out is the hospitality. If you are the type that likes to sit by yourself and not talk to anyone at breakfast, then DO NOT stay at Cruden Bay B&B. Ian loves to chat, tell stories, and even offer his guests a wee nip of scotch in the morning. The odds are that if they’ve been to Cruden Bay they know Ian. His stories of Herb Kohler, his daughter’s golf career, and others are worth the trip alone. Our breakfast chatting with Ian was one of the more entertaining moments we had off the golf course. And no, we didn’t take him up on the offer of scotch. My day at Cruden Bay started with the pro shop telling me they were giving me back £20 of my prepaid fees because the greens had recently been aerated. Needless to say, this was a shock. I have never been to a golf course, much less a top 100 course, where they cut you a break on anything. I played on several of the Reynolds Plantation courses during Masters Week (prepaid of course), and they were in horrible shape. There was a better chance of me getting a tee time at Augusta National that week than getting a dime back from the folks at Ritz-Carlton. One of the many things I love about Scotland is how proud the locals are their fantastic golf courses. There is never a sense of exclusivity or snobbishness (except maybe at Muirfield 😉 ). In fact, it’s the exact opposite at Cruden Bay. They have a world map where visitors pin their hometown so you can see how far and wide people have come to play this amazing golf course. During my visit to the course, I was lucky enough to be shown around the clubhouse by Ru MacDonald, host of the Scottish Golf Podcast. Cruden Bay and Scotland itself for that matter could not have a better ambassador than Ru. As much as he loves the game itself, I suspect he enjoys talking about Cruden Bay and other links golf just as much. Most golf courses (if you’re lucky) will present you with a bag tag or similar trinket to commemorate your day at their club. Cruden Bay, on the other hand, gives you a tiny bottle of their scotch to take with you. On a related note, a few days later when I was playing Royal Dornoch I was putting on my shoes in the locker room and what did I find in the trash? A tiny empty bottle of Cruden Bay scotch. I’m not sure if I’m appalled by this, not waiting for a more appropriate moment to consume this unique drink. Or that may have been the most appropriate place to drink it, on the grounds of one of the few courses that can compare to Cruden Bay. Either way it’s a neat little gift and one that I won’t be drinking anytime soon. Many of the modern golf facilities in the United States are beautiful, well-maintained courses, but they were designed around a purpose other than the golf course. Typically it’s a housing community or resort but often this means the holes are separated by long cart paths, making it feel more like a random collection of holes rather than a cohesive journey on a golf course. 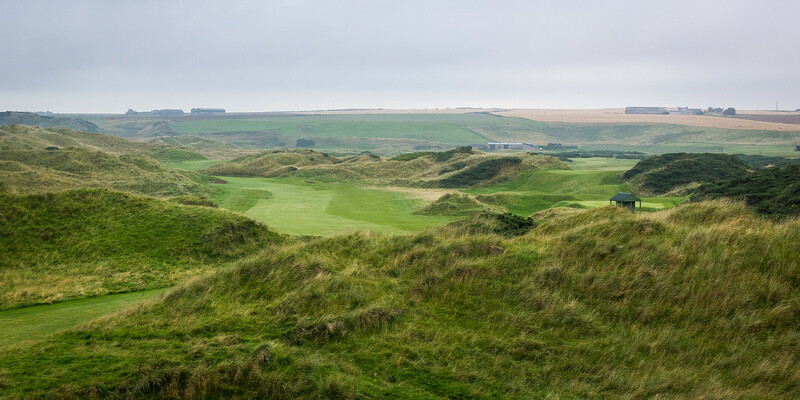 What makes Cruden Bay so cool is that the round starts out at the clubhouse, the first four holes bordering the local community, then heading out toward the dunes, playing from the high ground back down, then up again. 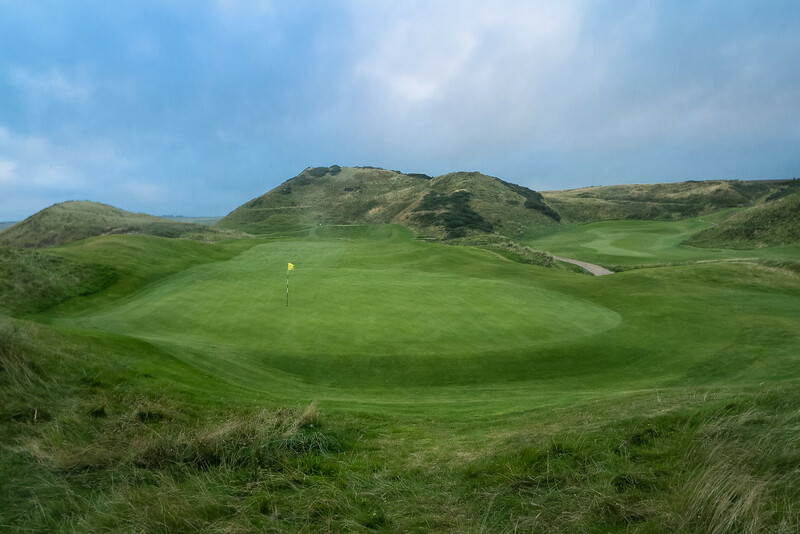 When you complete your round at Cruden Bay, you’ll feel like you journeyed to the end of the earth and then returned to civilization. While this hole has been photographed and discussed ad nauseam, it is a thrill to see it for the first time. On one side you have the beautiful little seaside town, the other is a beast of a par 3 when the winds are up. Playing at about 190 yards into the wind, I hit a 2-hybrid on the screws and still found myself well short of the green after rolling back down the hill. Even though I bogeyed, I still smile when I think about that part of my round. In contrast with most of the course and links golf in general, there is a bit of a walk from the 8th green to the 9th tee. Part of the way up you might start to curse the Scottish tradition of walking instead of riding in a golf cart. It’s not a terribly steep path but long enough that you’ll feel it. Rest assured though that the walk is worth it. And I mean really worth it. It seems like you can see forever; from Slain’s Castle off in the distance, the waves crashing below, to seemingly the rest of the golf course 100 feet below where you’re standing. The view is one of my favorites in all of golf. Just enjoy my pictures of it until you play it yourself. 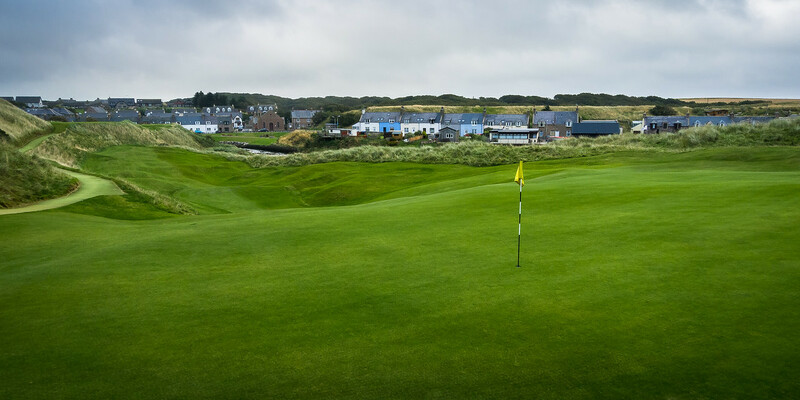 As of 2015 the visitor weekday green fees at Cruden Bay were £100, or roughly half of some of its more famous neighbors. I could go on about a 5000-word rant about top 100 ranked golf courses and their fees, but I’ll refrain here. 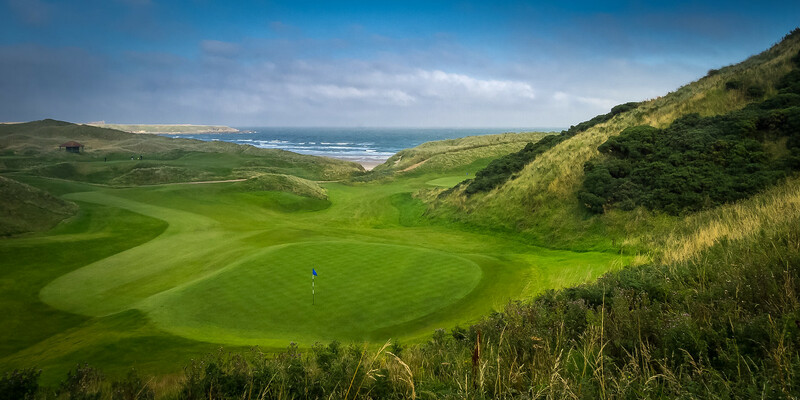 Just know that of the “trophy” courses one can play in Scotland, Cruden Bay might be at the top of the value list. I realize that the height of the dunes on a golf course has zero relation to the quality of the layout. There is something special however about the terrain at Cruden Bay. 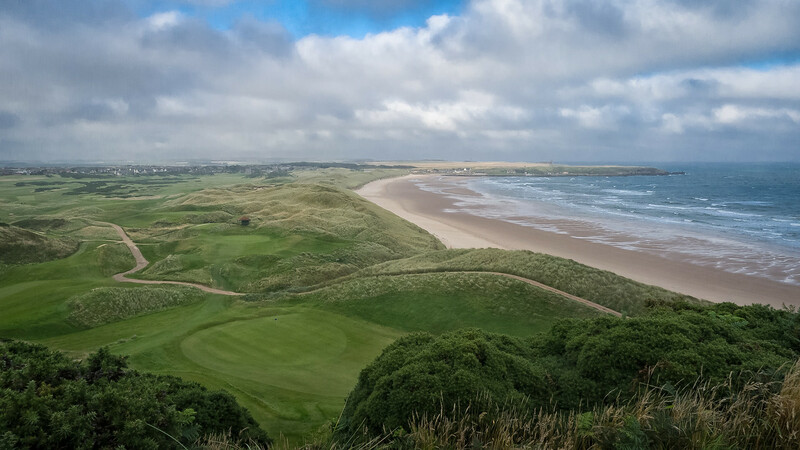 It’s not so much that you’ll look around and say “wow” at the dunes around you (although you will), what makes the course special is that you feel like you’re playing over those dunes. They are truly part of the golf course rather than just beautiful scenery. 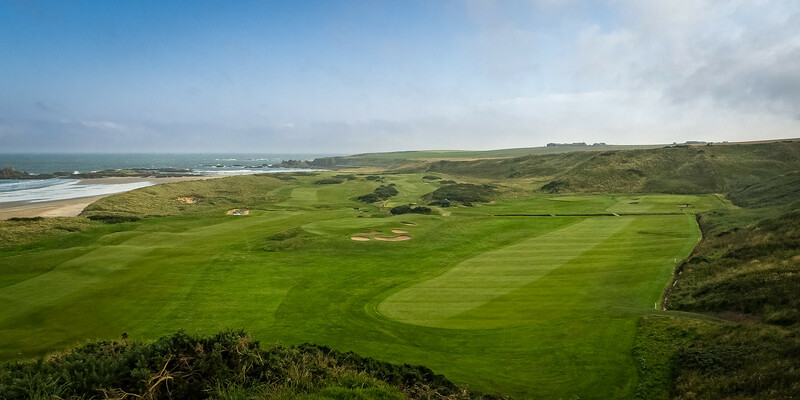 So what did I like best about Cruden Bay? Besides the people I met I’d probably say the view from the 9th tee box. I could have spent an hour up there, watching the golfers below, taking pictures, just enjoying the spectacular view. So allow me to give one last piece of advice on your trip to Cruden Bay. Remember that little bottle of scotch I mentioned earlier? Throw it in your golf bag and drink it with your friends on the 9th tee. I can’t think of a more appropriate place to enjoy it. If you liked the photography in this post, click here to go to my website and view the full-size images. All photographs are free to use as wallpaper or may be purchased as prints.